Gorgeous George is to bash the banks today as he sets out his plans to ring fence their operations. Once again, a politician will make a populist speech to show that the Tories are being tough on the banks, making them safer and ensuring that we don't see a repeat of the banking crisis of 2008. Ultimately, he will suggest that his plans mean that UK tax payers will not have to bailout banks in order to keep money being distributed from cash points across the country. More than anything else, we're likely to see an attempt to curry some favour with the electorate as banker bashing remains a very popular pastime, particularly as scandal after scandal continues to hit the industry. There's no question that banks, and RBS in particular, became too big during the boom years. Even now, years after the banking bubble burst, the industry is still going through seismic changes. Unfortunately, completely splitting up the banks isn't going to help the industry or the economy in the long run either, regardless of whether it's a popular move or not. What we need right now is for the banking industry to support the economy by lending to businesses and consumers. Stringent ring fencing, or splitting of the ''casino'' bank and the retail bank, is likely to curtail this. 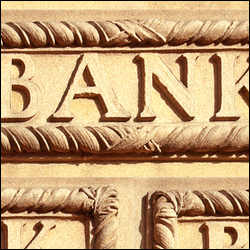 Despite the government's best efforts to apply pressure on banks to lend more, regulation is hampering their efforts as banks have to hold more regulatory capital. As a result, on the one hand you have the government looking to separate the banks, something which is counterproductive to increasing the flow of credit, and on the other you have the Funding for Lending scheme. Banking shares haven't been affected too much this morning ahead of the Chancellor's speech, but the FTSE 100 has got off to a negative start.